The Intel Core i5 6400 processor is a lightweight ready to enter the middleweight division. Built on the Skylake architecture with a 14nm manufacturing process, it is on par in terms of build with the i7 6700K. However, does it have what it takes to be a powerful and yet power-conscious CPU? From the onset, let me be honest that this CPU is a tad slower than its elder siblings and obviously compared with the latest 7th generation Intel processors but that doesn’t mean it won’t do the job. The only true question, therefore, is what kind of job are you tasking to it with? From the pricing point of view, i5-6400 is the cheapest i5 6th generation processor you can buy in the Skylake range. What this means is that while you spend less, you still get the majority of the assets that all its elder siblings have. It has 1MB of L2 cache, 4 physical cores and 6MB of L3 cache. The true difference lies in the clock speed. This is where corners are cut to reduce the pricing. The i5-6400 operates at 2.7GHz standard and under Turbo Boost can go as far as 3.3 GHz. Compare this with the i5-6600K that begins with 3.5GHz and peaks at 3.9GHz. Obviously, there’s a wide berth between the two when it comes to clock speeds. But, the plus side to this is that the 6400 consumes 65W rated power, which is significantly less than what the 6600K requires at 91W. Like I mentioned before, the i5-6400 does get 4 cores and so it should do better than all i3 processors. However, it is the clock speeds that are significantly lower. What does this translate to? Well, it meant that in our benchmarks, the if-6400 gave decent multi-core performance but had poor single core results as opposed to the rest of the lot. Take the Cinebench R15 single core tests. The i5-6400 barely managed to bring in 142, which is poor. It even falls behind Core i3 Skylake processors that have higher speeds. The closest in terms of its Cinebench scores is probably an i3 from 2 generations back. However, all is not lost. When it came to Cinebench’s multiple core testing, the i5-6400 picked up the slack and outperformed all i3 processors by sporting a 524 score. This is way higher than what the i5-6100 gives, but that should not surprise you since the i3 chips all have just a couple of cores. However, with respect to costlier i5 and i7 chips from the 6th and 7th generation, the score was low. But, don’t take this into consideration if you are on a limited budget because the multi-core performance on Cinebench suggests it is a decent alternative to the K suffixed cores. As far as performance against AMD processors go, the closest performer is AMD FX-8350. With about 100 on the single core benchmark and 700 on multi-thread tasks, the FX-8350 becomes its rival. Point to note, though, AMD is almost always better with multi-threaded tasks with similar core count Intel i5 processors. Where the i5-6400 really shines though is in Geekbench tests. Here it posted an 11,303 multi-core test score, which is nearly 2500 points clear of its nearest competition in the i3 CPU stable. AMD FX-8530 came pretty close in multi-core tests but in single core tests on Geekbench it managed an abysmal 2000 points, which is nearly 2000 points less than what the i5-6400 posted. As far as video encoding goes, the core i5 completes the test in under six minutes with a good one minute lead on i3 competitors. Unfortunately, once again single-core performance issues came to the forefront when we went on to Dolphin Emulator benchmarks. Here, it was the slowest of the entire lot of CPUs we tested managing only to beat the AMD processors. Now let’s get to the gaming aspects of this CPU. Does the single core performance impact on gaming experience? Yes, and no. Take Battlefield 4 for instance. Here its performance on discrete GPUs is pretty decent though not great. It outperforms only older generation Intel CPUs but comes in tied with i3-6100 performance, which was a bit of a shock honestly. With Battlefield 4 it matches the core i3 6100 performance but on Bioshock, it falls behind by a few frames. The good news though is that this processor does not bottleneck any game. Heat issues are definitely not a concern with the i5 6400 considering its lower power consumption levels. Even at full Turbo, it will maintain temperatures less than the average of an i5-6600K. In other words, you can easily use the stock cooler that comes with the 6400. On idle, it consumes around 48W and on stress testing, it rises to around 91W. That is way better than any other i5 in the market. AMD in terms of power consumption and heat generation does worse than Intel so, comparing the FX-8350 wasn’t necessary for us. Priced economically and provides decent gaming performance. If you are on a budget but need some amount of performance boost, this is a good processor. All the build quality of 6th generation Skylake architecture. Poor single core performance. Can’t match single core performance of Core i3 6100. Integrated GPU is absolutely useless with gaming in modern to two-year-old titles. AMD processors that cost less give a similar performance though not when it comes to power consumption and heat generation. Should You Buy The Core I5-6400? Yes, this processor seriously lacks in the single core performance department and if cost is your overbearing factor then you really have limited options. In those options, the i5-6400 is a decent bet for now and the future. Single core performance is just adequate so you won’t get bottlenecked. As for any hyper-threaded performance, you won’t feel the pinch at all. Like I said earlier, the i5-6400 is a lightweight processor that tries hard to fit into the middleweight segment but fails only by a few pounds. Currently, we feel you will be better served purchasing a Core i3 7100 processor considering the change in generation and better scores of the i3-7th gen over the 6th generation processors. 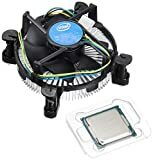 Besides, the pricing even makes this a more reasonable bet but if multi-core performance is what you are after then the core i5 6400 is what you should consider. Basically, for those who need a processor to do music or video editing, this is the perfect price to performance choice. But if overclocking or gaming and single-core performance is what you need, look elsewhere. Cheapest of all Skylake processors with four cores onboard, the i5-6400 is indeed a good performer but it lacks in several areas. Single core is its biggest performance lag but if you can live with that, this is a sacrifice worth making. If not, prefer the i3-7100 Intel processors.